Stained glass and rose windows in particular have been a source of great beauty and inspiration throughout the centuries. What are the origins and meaning of the Gothic Rose Window? How were they made? Learn about one of the most beautiful and inspirational aspects of medieval architecture. See how this art form can be interpreted and used in the context of the current Middle Ages. The origins of the rose window has many roots, however, it is definitely a phenomenon of the French Gothic period. The window itself is a descendant of the Roman oculus--which is a small round opening in a wall. 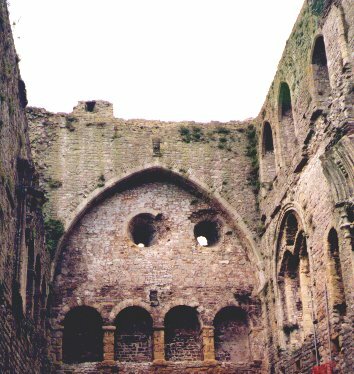 During the Romanesque period, this opening developed into a window (such as seen in the remains of the keep at Chepstow on the Welsh border). In church archictecture, the oculus was usually found on the west façade. Finally, during the 12th century, as the architectural advances of the Gothic period allowed greater and greater openings to be created for cathedral and church windows, the size of this round window increased until it reached it's greatest dimensions--the entire width of the nave. In the sixth century, Pope Gregory the Great had made a plea that scriptural scenes be depicted on the walls of churches for the benefit of the unlettered faithful. A Synod at Arras in 1025 reiterated the recommendation, for "this enables illiterate people to learn what books cannot teach them. 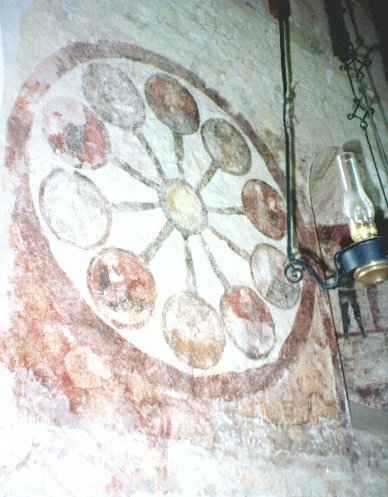 "[6, p.130] The fresco on the wall of the Church of St. Mary in Kempley is an example of such wall paintings. This particular one is reminiscent of a rose window. The domes of Early Christian and Byzantine churches often utilize a radial design around Christ or the Virgin and Child. Those powerful images in mosaic and in frescoes would have been a large influence on the concept of the giant rose windows that appeared in Paris following the first three Crusades. With advancements in construction, glass eventually replaced wall space and the paintings on church walls were replaced with glass. Stained glass and rose windows owe much of their design and themes to those early paintings and the religious art of the Byzantine and Christian churches of the Middle East. The abbey church of Saint-Denis is considered the first Gothic building. Abbot Suger commissioned the church to his own specifications, and upon its completion in 1144, was awed by the splendor of the stained glass that transformed 'that which is material to that which is immaterial.' By the time Saint-Denis was completed, stained glass had been in use for over a hundred years in relatively small windows in selected parts of certain churches. The combination of stained glass with ribbed vaulting that allowed greater space, flying butresses that allowed greater height for walls opened the building in ways that the heavy, solid Romanesque style of building could never achieve. 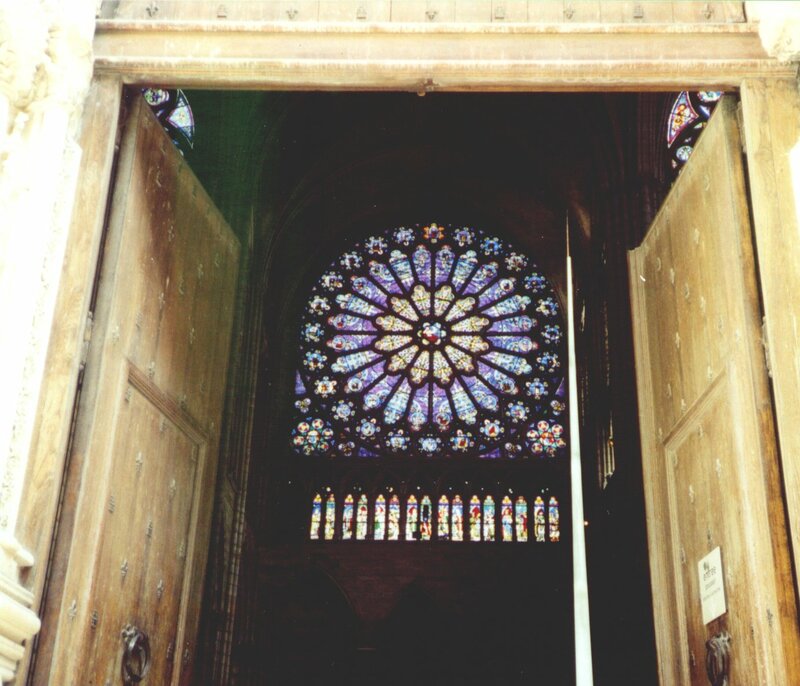 However, Saint-Denis did not have a rose window--it merely led the way. The first rose window was probably created about the year 1200. Within 50 years, its use in cathedrals had propagated throughout France--mainly in the north. Some rose windows appeared in England, Italy, Spain, and Germany, but they are primarily French in origin. What is the meaning behind a rose window? Many contemporary authors wax on about Jungian psychology and the rose window as a mandala, which represents the "expression of human aspiration towards wholeness and coherence." [2, p.10] Mandalas have existed in Eastern religion and philosophy for centuries, and in modern thinking, the medieval rose window serves much the same purpose. The rose window operates on many levels: spiritual, meditative, and emotional. Abbot Suger's observations underscore how deep an emotional and spiritual chord is struck by the play of light that passes through the glass. The instructional aspect of rose windows is plainly visible by the subjects chosen for display in each petal--the medieval calendar year, the virtues and vices, the saints, etc. In much the same way the center of Eastern mandalas depict the "godhead" or divine aspect of the world, so do rose windows. Typically Christ or the Virgin and Christ are found in the central rosette of most windows. In eastern philosophy, there are many paths to reach the divine, and these are represented by "gates" at the cardinal points of the mandala. By the same token, saints depicted in the petals of a rose window can be seen as intermediaries (or paths) to Christ. Simply following the tracery with the eye and taking in the patterns found in a rose window can put one into a very calm or meditative mood. Meditation is very much like and is be very conducive to prayer. Although placing one into a meditative or prayerful state may not have been a direct intent of the rose window, it is certainly a benefit! The basis of many churches is geometry and proportion. Numbers had a metaphysical significance, and were thought to have occult power. Every aspect of the medieval cathedral utilized that significace: the number of pillars in the choir, the ratio of the levels of in the triforium, etc. Rose windows are no exception to this rule. Rose windows utilize geometry on three levels: manifest, hidden, and symbolic. The visual impact of the rose window is manifest. Every space is defined by another smaller geometric figure - a trefoil, a quatrefoil, rosette, or spherical triangle. Even the glasswork itself adds to this geometry. The hidden geometry defines the exact placement of every major feature of the rose window-relating to the radial elements, concentric divisions, and all to the center. The symbolic geometry is found in the the numerical significance in the chart above. Circles, squares, triangles, stars, and, of course, the 12 major divisions typically found in rose windows all point to the finite and infinite, earth and heaven, or matter and spirit. Of course, the geometric significance is rather an intellectual one and probably lost on most people other than in the pleasing proportions and the way the window draws the eye. Often, there is a more direct significance in the theme of the scenes depicted in a rose window. Common images were: the seasons and the months/labors of the year; the Zodiac; the elements; the virtues and the vices; the Apostles. Some rose windows were very specific in their theme. For instance, that in the north transcept of Notre Dame portrays the kings and prophets of the Old Testament. The south window at Beauvais depicts Creation according to Genesis and then a sequence of stories leading from the Temptation in the Garden to the beginning of Exodus. The west window of Chartres depicts the Last Judgement, as does the rose window at Sainte Chapelle in Paris. Several books, collectively known as On Divers Arts, attributed to the monk, Theophilus Presbyter, were written in the mid-twelfth century. This is an extremely valuable work as it details many different medieval crafts and their practical application. The second book of On Divers Arts, The Art of the Worker in Glass, outlines the entire process of creating a stained glass window, including the building of the kilns and furnaces. Theophilus indicates three furnaces are required: 1) a furnace for working the glass (this is where the glass is melted and worked; 2) an annealing (or cooling furnace); and 3) the furnace for spreading the glass sheets. Glass-makers of the twelfth century appear to have used a compound comprised of about 50% silica (as opposed to the 75% silica compound modern glassmakers use). An important item of note here is the chemical composition of the glass. Theophilus's method only outlines the use of sand and beechwood ashes. Unbeknownst to him, utilizing other types of ash and various metals would have produced additional colors. However, Theophilus managed to develop several different colored glasses simply by changing the duration of the glass working process: white, saffron-yellow, various shades of red, and finally, purple. Research has shown these colors to be the result of high concentrations of manganese in the beechwood ashes coupled with varying iron content picked up from the clay posts used to work the glass. He does note how the French make shades of blue, green, and purple, claiming that they use glass vessels and mosaics from "ancient pagan buildings" by melting those same vessels down with white glass to make colored sheets of glass. The medieval window maker was instructed to make a smooth flat wooden board large enough to work "two sections of each window" on it. The board was to then be dusted with chalk, watered and rubbed with a cloth to fill in the gaps and to provide a light-colored work surface. The window section was then drawn on the board directly with compasses with lead or tin tips. A cartoon of the final look of the window was then drawn with red or black pigment on the board and indicating the space needed (the borders) for the lead cames (the leading between pieces of glass). The next step was to take the glass to be used and to transfer the cartoon onto the glass itself. Usually this was chalk ground with water that was applied with a brush. The glass was then cut to its shape using an iron cutting tool that had been heated "red-hot", and then trimmed with a grozing iron. Pigment was applied as necessary to achieve specific colors and effects (such as shadowing and highlighting). Lettering was created by covering the surface with an opaque pigment, and then writing the letters (etching) in the pigment with the handle of a brush. Once the glass was painted, the pigment was then fused to the glass by firing the glass in a kiln. Although the glass provides the color and much of the beauty of a stained glass window, the tracery framing the window is equally important. It provides the overall pattern and enhances the theme of the window. Tracery, of course, is the bailiwick of the stonemason. The art of the stonemason is a study in and of itself, and is beyond the scope of this class. Most of us do not have the resources to create a full-scale rose window, much less transport such a thing to SCA events. Even if a window were scaled down for easier transport, there is still the fragility of the glass and difficulty of finding a safe place for its display. A further consideration is that SCA policy generally prohibits excessive religious displays or functions with the main areas of an event. Medieval rose windows are quite clearly an ostentatious religious display. What follows are a few ideas of how we can recreate a rose window in an SCA context. Many church windows were provided or sponsored by wealthy patrons. Quite often, an heraldic display of arms was included in the window to show who the benefactor was. I have begun several heraldic rose window projects in which the areas that would normally contain pictures of the Apostles or scenes from the life of Christ now contain people's SCA armory. By applying the idea of heraldic stained glass to a rose window we end up with things such as the Falcon Cree and House Corvus Rose Windows. If you simply want a medieval-style rose window, medieval windows do provide some less ecclesiastic subjects to replicate. The rose window in the south trancept of the cathedral of Notre Dame in Paris displays signs of the zodiac and scenes from the medieval calendar year, as do many other rose windows. Some rose windows are almost simple color designs and the effect of the tracery becomes more important. The canton of Falcon Cree and the House Corvus rose windows are simply painted canvas. They have the advantage of being highly portable and easy to make. Another medium to use would be plexiglass. Plexiglass will have some of the same transportation issues as real glass, but has better durability. Plexiglass also comes in varying colors and can be painted with translucent acrylics to achieve an effect similar to real stained glass. A wooden frame and perhaps even wooden tracery can be made from luan or thin strips of wood that can be painted to look like stone. Various arts supply and craft stores should be able to supply spray paint for stained glass and even fake leading lines for the more ambitious project. Caulking can found in metallic colors that can be used to achieve the same effect. Create stained glass windows with construction paper, glue, and colored tissue paper. Crayons and wax paper can be used to create a window and then heated to run bond the wax paper and crayon. Theophilus (John G. Hawthorne and Cyril Stanley Smith, trans.). On Divers Arts. New York: Dover Publications, Inc. 1979. ISBN: 0-486-23784-2. Gies. Frances and Joseph Gies. Cathedral, Forge, and Waterwheel. New York: HarperCollins Publishers, Inc. 1994. ISBN:0-60-016590-1. Grodecki, Louis, and Catherine Brisac. Gothic Stained Glass: 1200-1300. Ithaca, New York: Cornell University Press. 1985. ISBN: 0-8014-1809-7. Thorpe, J.T. Photographs from a medieval tour of the Welsh border © 1997. Thorpe, J.T. Photographs from the Basiclica of St. Denis in Paris, France © 2000.